An official poster has been released for the upcoming release of Spooks: The Greater Good, the big-screen spin-off from the BBC spy drama. 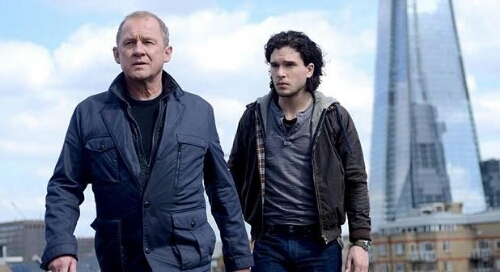 The poster features mainly on Kit Harington as former MI5 agent Will Holloway, with original Spooks star Peter Firth, as stalwart Sir Harry Pearce, Jennifer Ehle, Elyes Gabel and Eleanor Matsuuri pictured in the background. The movie sees MI5’s Head of Counter-terrorism, Harry Pearce blamed for the escape of charismatic terrorist Adam Qasim (Elyes Gabel) from MI5 custody. Disgraced and forced to resign, no-one’s surprised when Harry disappears one night off a bridge into the Thames. Former agent Will Holloway (Kit Harington) is brought back from Moscow to uncover the truth they feared – Harry’s still alive. He’s gone rogue, and needs Will’s help. Lara Pulver, Tim McInnerny and Hugh Simon also reprise their roles in the film from the popular BBC show which ran for ten series. David Harewood and Tuppence Middleton are also among the cast. 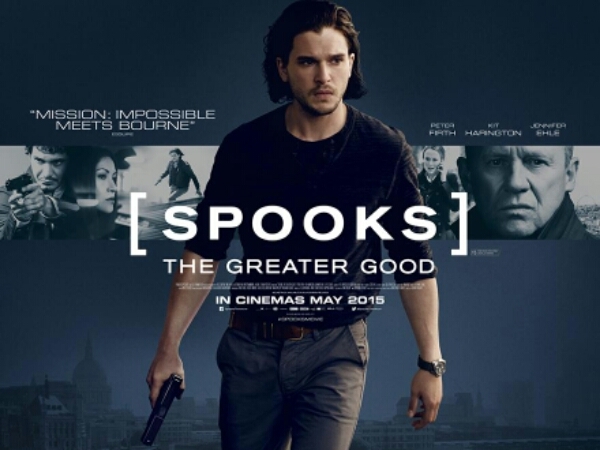 Spooks: The Greater Good is released in UK cinemas on 8 May 2015, with a US release date yet to be set.